This month's full Moon will appear 30% larger in area than the smallest full Moons. But can you tell just by looking at it? Maybe! A comparison of the Moon at its closest to Earth (left) and farthest. 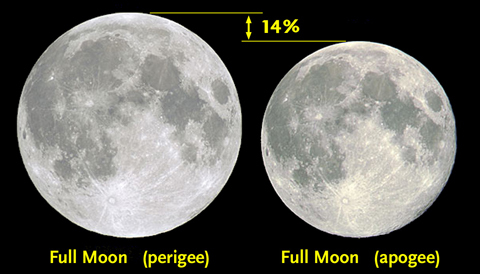 The change in distance makes the full Moon look 14% larger at perigee than apogee. It's "supermoon" season again, with three full moons in a row taking place quite close to lunar perigee — that is, when the Moon is closest to Earth on its somewhat elliptical orbit. Monday's full Moon is the closest of the three, and as pointed out here already it will actually be the closest full Moon since 1948. This factoid — even promoted by NASAnow — is causing considerable media interest that splits two ways: some articles tout it as a sky sensation, while others claim that all full Moons look the same to the human eye, regardless of their distance. A closer look shows that neither statement is correct and that one should enjoy and observe supermoons in general. It all comes down to relative numbers: (1) the changing distance of the centers of Moon and Earth, (2) your changing distance to the Moon each night as you race around the center of the Earth while standing on its surface, and (3) the differing Moon-Earth distances during various full Moons that occur at perigee. We're fixated on the latter, yet in comparison it's practically irrelevant. For example, the Moon's proximity on November 14th is only 0.008% farther than it was during the previous extra-close minimum in 1948 or 0.02% farther than during the next one in 2034. These differences of a few dozen kilometers change the outlook of the Moon's disk not one bit: Monday's "supermoon" is exactly as good as the ones of 1948 and 2048. Compared to the ones in 2015 and 2017, it's just 0.1% and 0.02% closer, respectively. Likewise, it's 0.6% and 0.8% closer than the so-called supermoons of October and December 2016. To the eye, there's still no difference whatsoever. Much more dramatic are the effects due to your position on Earth, an effect that's often overlooked. As the Moon arcs from the horizon to nearly overhead, its distance changes by a few thousand kilometers. This changes the disk's apparent diameter by about 1%: it looks smallest moonrise or moonset and and largest when transiting. And your latitude (and thus the Moon's altitude when highest in the sky) can also make a difference of several thousand kilometers or about 1%. The might look close when it's rising or setting over your horizon, but at such times it's actually several thousand kilometers farther away than when it's overhead. So this "personal" effect dwarfs the differences of the minimum distances of the November supermoon with the full Moons before and after it — let alone the minute differences between the "best" supermoons over time. And yet the difference is still invisible to the eye. But that changes when one compares such perigean full Moons with full Moons near apogee, as was the case in April: then the change in diameter is closer to 14% and the disk's area (and brightness) near 30%. But Can You See the Difference? Until six years ago I was blissfully unaware that this effect is actually detectable with the unaided eye and without any measuring devices. Just before the "supermoons" became a media sensation, however, I accidentally noticed that the February 2011 full Moon appeared unusually large in the sky. Checking an ephemeris revealed that it was indeed very close to perigee. On various occasions since, the sequence has been the same: I'll spy an seemingly oversize full Moon, then confirm that it's close to perigee — each time not knowing beforehand where in its orbit the Moon was. Nowadays, with supermoon articles everywhere, such "blind" experiments are hard to pull off. But those firsthand experiences allow me to state that perigean full (and gibbous) Moons do indeed look bigger and more impressive. It's important to make these observations with the Moon high in the sky, well away from the horizon, foreground buildings, tree branches, and even high-contrast cloud edges. Anything in the Moon's vicinity triggers the mysterious "Moon illusion" to some degree. And seeing a larger-than-normal full Moon in the sky, well away from anything else, is what makes it so remarkable. It would be fun to do some experiments under controlled conditions. 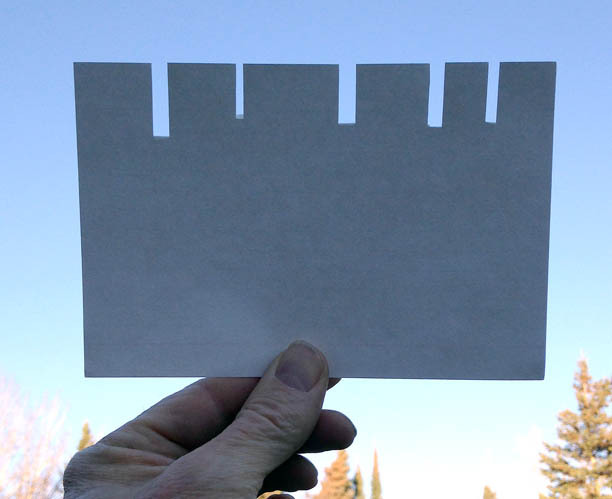 Perhaps you can try Bob King's clever handheld "slot" method. Or try sketching the maria that you glimpse on the lunar surface at different times — does the visibility of small details improve near perigee? Maybe a clever digital designer out there can create a virtual-reality experiment to test our visual perception of different-sized full Moons. Finally, I wonder whether the changing apparent size of the Moon was noticed centuries or millennia ago. Alas no such observations have been located thus far in the literature. So we've come full circle then: do not let articles that tell you the changing size of the Moon "cannot be seen" distract you from making observations yourself. Watch the supermoons of November and December, high in the sky, try to memorize "what they were like," then repeat the observation several months later. Some see the effect easily, others struggle, and most just never even try. But if you do see a difference, you have seen a fundamental property of the universe —orbits are usually elliptical — with your own eyes.